As much as I love to shop, I am ashamed to say that I've never been to a sample sale until now. Circumstances always have a way of preventing me somehow. Those pesky work deadlines have to be met and usually they fall somewhere in the afternoon, making it hard to go to the sample sales that begin around 4pm. And if you're not at the sale right when it starts, what are your chances of getting the best stuff before it's all been picked over?! The first time I had a chance to go, my friend mizzj over at Being High Maintenance, Not Bitchy invited me to the Tension Clothing sample sale, which I sadly missed because I had an important deadline on the Friday that it started. I was left reading her account of how much fun she had and what cool stuff she found, stewing in my own envy. Therefore when another friend told me about the Narcissist Clothing sample sale taking place on Friday February 8th, I was determined to go, deadlines be damned. Narcissist is a local designer known for its dresses and feminine separates, and all of their clothing is manufactured in Canada. I honestly wasn't that impressed with the offerings on their website; to me the designs seemed a bit plain and not unlike the umpteen different matte jersey dresses and separates I can find elsewhere. But I trusted my style-savvy friend who told me she "lurves" their dresses. Well, the afternoon of the sale itself, somehow our communication wires got crossed and my friend thought I was going to this other sample sale in Vancouver's trendy South Main district that she'd told me about. Then she decided she was too burnt out and broke to go to either one, and I ended up going to the Narcissist sample sale by myself. I was one of the first in the door and all business as I browsed the two racks in the small studio space. One part of the room was partitioned off with a white canvas curtain as the communal changing area. With three dresses, a sweater, and a skirt draped over my arm, I headed behind the curtain. I remember the half-competitive, half-sisterly atmosphere at the Army and Navy shoe sale as women helped their friends find shoes in their sizes and eyed the shoes in other women's baskets at the same time. The Sisterhood of the Sample Sale Communal Fitting Room is exactly that but magnified. I tried on a gray wraparound sweater with a white skirt. 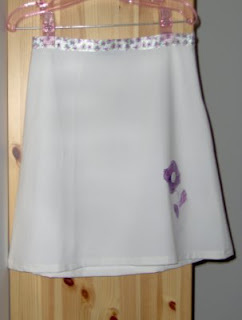 The white skirt was a maybe and I put it aside; the sweater didn't quite look right on me and I decided not to go for it. I pulled those off and put on a silver sequined chiffon sheath with a ruched chiffon empire waist. One girl who was trying on an irridescent teal dress saw my silver dress on me and said, "I saw that out there too. Do they have that in another size?" I said I didn't know. Moments later she returned with the dress I had on, saying, "I saw how good it looked on you and decided to try it on." In the end neither of us got it; the waist felt very binding on that dress and the sequins scratched our arms and faces as we pulled it off. Next I tried on a lacy irridescent brown dress. The women standing on either side of me cooed over how good it looked, and the one on my left (who was roughly my size) left the changing room to find one to try on. (Much to my catty satisfaction, the one she found was one size smaller than mine and too tight for her so she didn't buy it.) I definitely felt like a million when I saw my reflection. I felt even better when one of the saleswomen came behind the curtain and crowed loud enough for everyone there to hear, "That dress is perfect on you! The colour, the fit, everything, and with those pearls you're wearing...it's like it was made for you." Beaming, I took it off and pulled on a very Blair Waldorf, very preppy nautical-inspired light blue cotton sundress with navy trim. (The woman on my left saw the dress on the hanger and asked if she could have it if it didn't work out for me.) Unfortunately, I didn't have as much luck with this dress; the zipper wouldn't even do up! I pulled it off and passed it on. She tried it on and the zipper did zip for her, but she felt so constricted in it she decided to pass on the dress as well. In the end I went with the white skirt (originally $99, marked down to $19) and the lacy brown dress (originally $155, marked down to $75). My total came to just a little over $100 after taxes. Given that I'm trying to cut down on my expenditures and save up money to go to New York and do a bit of traveling later this year, I suppose it's a good thing I didn't find too much to my liking at the Narcissist sample sale, but what I did find was well-made, unique, and really really cute on me! Oh wow, cute dress. Trés chic! I won't say anything else for fear of spoiling my anonymity... except that I vow to make it to the next sample sale, even if I have to leave my wallet at home so as to practice restraint. Really, I have too many clothes right now and I just found these two cute betsey johnson tops at a garage sale for $15 ea. Swoon - BJ! 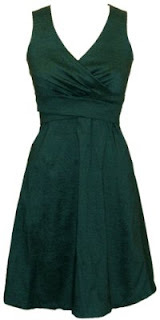 MizzJ - Haha this was the teal dress the girl tried on before the scratchy silver sequined dress! It looked amazing on me, but I could barely breathe in it, let alone sit, dance, or eat! Megan - Thanks! I can't wait for an excuse to wear it. And yes, next sample sale we're on!